MJM Limited announced that for the third year running, Director Fozeia Rana-Fahy [pictured] has been listed as one of the Top 200 international Powerwomen by Citywealth. The list honours 200 of the most powerful women in government, private wealth, education, private client advisory and philanthropy across the international financial centres [IFCs]. The IFC Powerwomen Top 200 list focuses on influencers as well as professionals and celebrates powerful women from diverse backgrounds. It recognises women of achievement who are trailblazers in their field, helping to promote business excellence in their home jurisdiction and consolidating the reputations of the financial services industry globally. Ms Rana-Fahy was featured on this prestigious global list in 2015, 2016 and now, once again, in 2017. 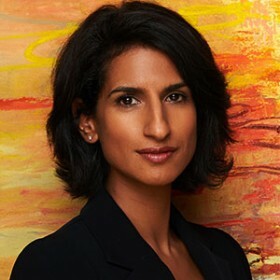 Client quotes collected by Citiwealth for the purpose of research for the list, include: ”She is a thoughtful, creative and forceful courtroom advocate” , and “Rana-Fahy represented my American client in a will construction dispute involving matters of first impression under Bermuda law. She impressed me as a thoughtful, creative and forceful courtroom advocate who can cut through complexity to focus the court’s attention on the strength of her argument” . MJM Limited congratulates Fozeia on her consistent recognition on the international Powerwomen list.